This is a cake that I made for my god son’s fifth birthday. One of the most fun cakes I ever did. The cake was four layers of red velvet cake , all made from scratch . In separate bowl put flour , salt, baking powder and cocoa blend set aside. Beat eggs, butter and sugar until light and fluffy. Add in the sour cream and milk and vanilla and red food color. Now stir into the flour mixture until just blended , don’t over mix. Pour in pan and bake for 25 to 30 minutes or until toothpick comes out clean. Now that you have the red velvet recipe you will need cream cheese filling. And almost everyone has their own way of doing that so I will leave that to your choice for filling. I layered the cake and filled each layer with the cream cheese filling . The smell of the cake and the filling filled the air with such a great aroma, made me almost want to cut a slice. I wonder if anyone would of noticed . hehehe. 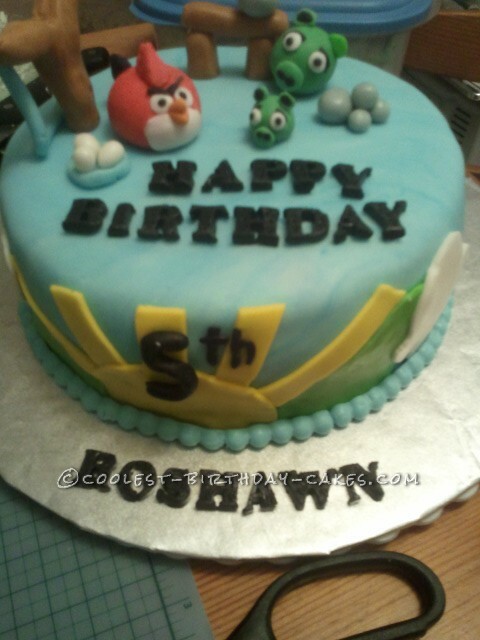 I made my own fondant and covered the cake, made my little angry birds and little pigs. I think it turned out pretty good. My god son was overjoyed that was what really mattered and to see the expression on his face was priceless . This was a cake that was worth doing.